A Double Death on the Black Isle by A. D. Scott, a Mysterious Review. Review: Set in the Spring of 1957 in the Scottish Highlands, struggling reporter Joanne Ross finds she must expose long hidden secrets if she is to get to the truth about the death of a fisherman in A Double Death on the Black Isle, the second mystery in this series by A. D. Scott. Joanne is in a failed marriage but still firmly married with two children. But having always been dependent on or for someone �— she's someone's child, someone's wife, someone's mother — she now wants to experience some independence. She takes a job as a typist for a local newspaper, hoping to become a journalist at the Highland Gazette. Her best friend is Patricia Ord MacKenzie, a woman she's known since childhood. Though of vastly different backgrounds — Patricia is wealthy, Joanne not — they've remained close. Joanne is happy for her friend when Patricia announces she wants to marry, but someone is clearly unhappy with the fact that her husband-to-be is a poor fisherman, Sandy Skinner, owner of The Good Shepherd. When a homemade incinerating bomb is thrown aboard the boat, destroying it, both Patricia and Sandy are undaunted and are wed as planned. Later, a local man is found murdered on the Ord MacKenzie estate and Sandy is accidentally killed when he stumbles over the Falls of Foyers. Though there is nothing to connect these two events, Joanne does not believe it to be coincidental and delves into the lives of her friend and family. A Double Death on the Black Isle is a stirring novel depicting a changing society, in particular what life was like for women in the relatively remote countryside of Scotland. The characters are likeable, the story — a hybrid between police procedural and amateur sleuth — quite engaging with good use of humor to balance the sometimes cruel acts portrayed and an unexpected plot twist or two towards the end. 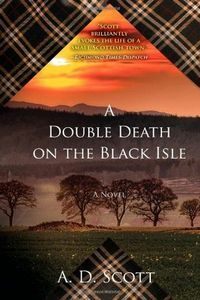 Special thanks to guest reviewer Betty of The Betz Review for contributing her review of A Double Death on the Black Isle. Acknowledgment: Simon & Schuster provided a copy of A Double Death on the Black Isle for this review.